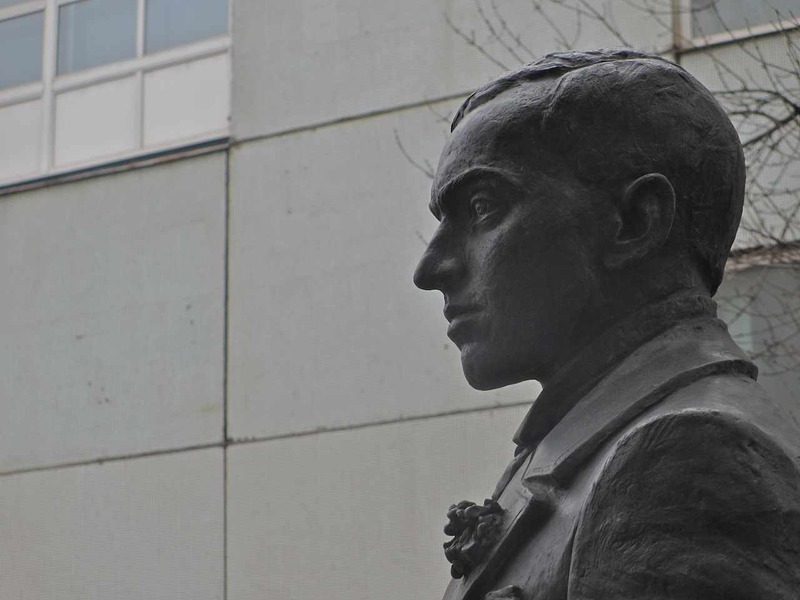 These days students coming and going at the Vakhtangov Theater’s Shchukin Theater Institute at 10 Bolshoi Nikolopeskovsky Lane in Moscow’s Arbat region pass under the gaze of the spiritual founder of their institution. 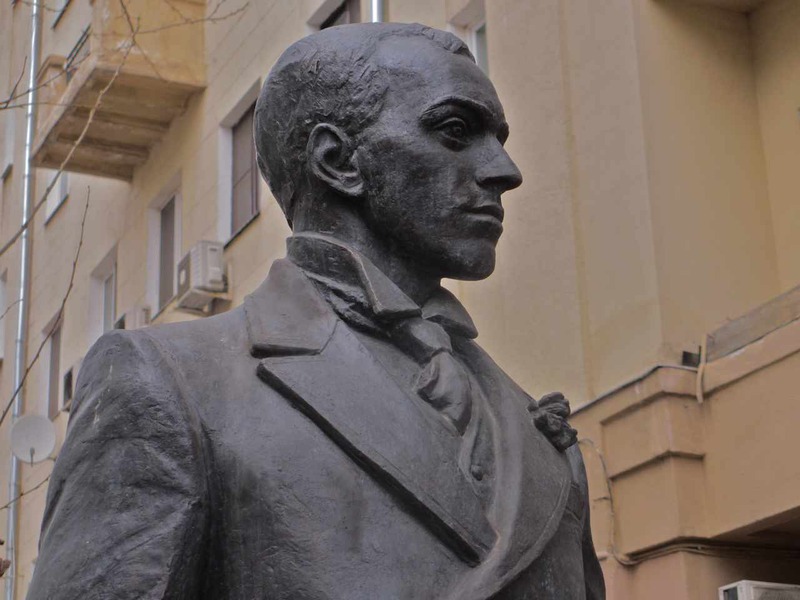 That has been true since October 13, 2014, when a small crowd gathered in the school’s courtyard to attend the unveiling of a new statue honoring Yevgeny Vakhtangov, one of the great directors of the pre- and post-revolutionary period in Russia. I am sad to say the ranking official that day was Russian Culture Minister Vladimir Medinsky, an odious, anti-culture figure, whom Russia will spend years, if not decades attempting to forget. Mark my word. But he was not the only person there that day, thank goodness, so we can also point out the presence of the great Konstantin Raikin, Alexander Shirvindt, Vasily Lanovoi and other first-rank actors who graduated from Shchuka, as the institute is referred to colloquially. Actually, Raikin pushed it a bit, because Vakhtangov (1883-1922) was dead before the restriction of cultural activity became Soviet policy. Raikin is, hereby, to be entirely exonerated, however, for I have little doubt he was less interested in historical veracity than in poking Medinsky in the ribs for this clueless bureaucrat’s often oppressive actions. Interestingly, Medinsky’s most notorious action to date, the destruction of Timofei Kulyabin’s much-admired production of Tannhauser in Novosibirsk, had not yet been foisted on us at this moment. That was to come just a month later. This statue, which stands a good eight-to-ten feet tall (including the pedestal), is interesting for its sense of smallness, even petiteness. 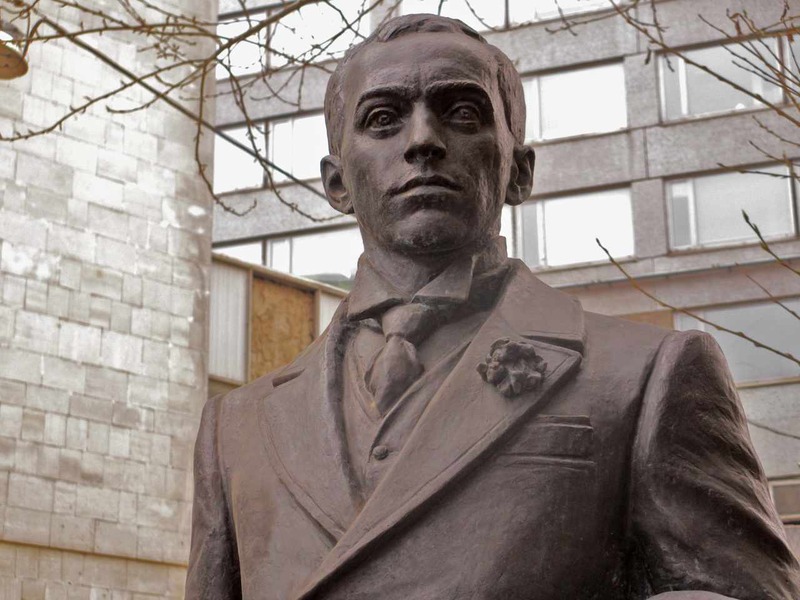 Sculptor Alexei Ignatov made Vakhtangov bigger than life, but gives us a full sense of Vakhtangov’s delicate build. Vakhtangov’s fame is rather astonishing, considering his extremely short career. He died at the age of 29, having staged just a handful of productions. 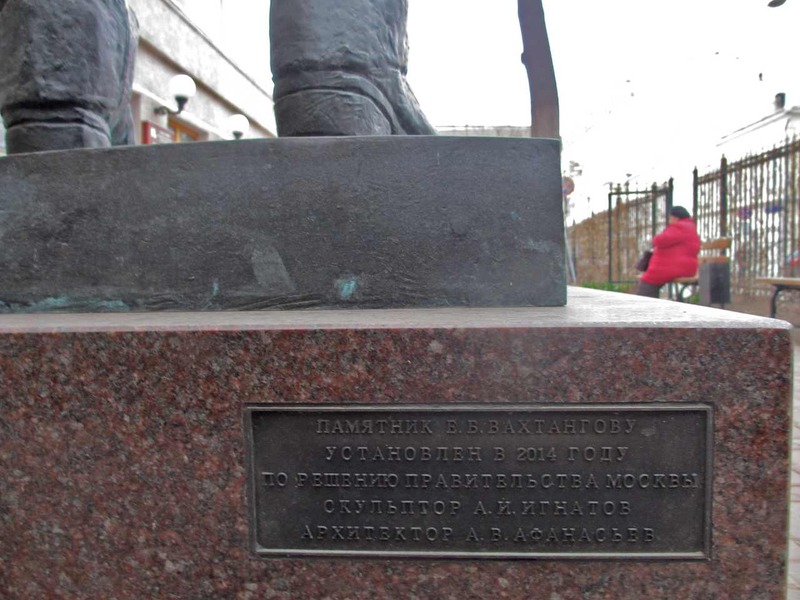 But his reputation as a brilliant pupil of Konstantin Stanislavsky at the Moscow Art Theater, and the huge influence of the shows he did stage, placed him in the pantheon of Russia’s greatest theater artists. He is always mentioned right along with the other great names of the age – Stanislavsky, Vsevolod Meyerhold and Alexander Tairov. Vakhtangov began collaborating closely with Stanislavsky in 1911; he then was working methodically (initiates will get the pun) on his acting system. Vakhtangov was one of several young actors who functioned as guinea pigs for the great man’s research. He worked in, and helped to found, the Art Theater’s 1st and 3rd Studios. As an actor he particularly shone in the famous production of Dickens’s The Cricket on the Hearth at the 1st Studio. 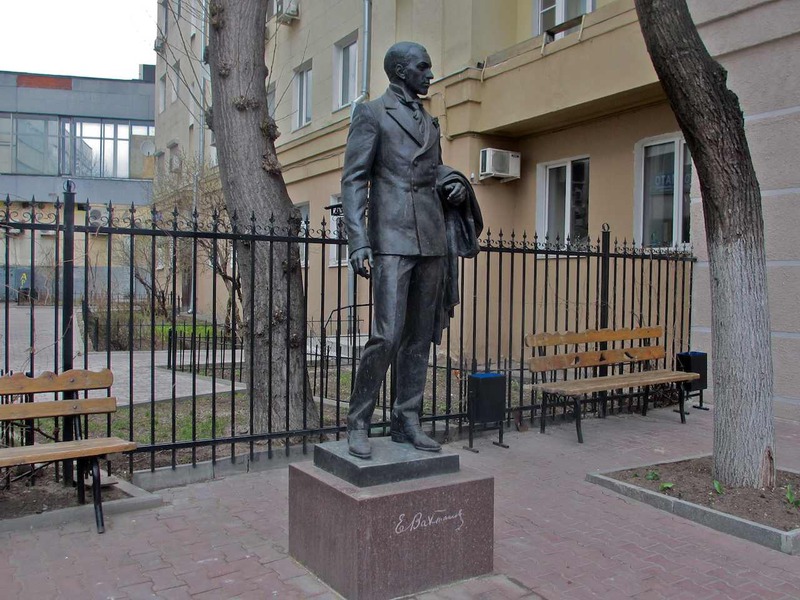 He also worked at many other theaters and clubs and cabarets around Moscow, including the Jewish Habima Studio, attracting the attention and respect of many important Russian cultural figures, including Alexander Blok and Maxim Gorky. His most famous productions included Maeterlinck’s The Miracle of St. Anthony (first version 1917, second version 1921), Ibsen’s Romersholm (1918), Strindberg’s Erik XIV (1921), Ansky’s The Dybbuk (1922) and Gozzi’s Princess Turandot (1922). The production of Turandot was, and remains, a cornerstone of what officially became the Vakhtangov Theater, when the 3rd Studio was renamed for the deceased director in 1926. Turandot, featuring its umpteenth cast, and having gone through numerous recalibrations over the years, is still to be found in the theater’s active repertoire. I made my first post on this blog exactly a year ago. It’s changed quite a bit since then. Maybe it’s even grown some. Maybe it will continue to do that in the future. At first I saw it as an opportunity to post photos I thought would be of interest. But as time went on I began looking more and more for stories behind the photos, some directly connected, some not. The photos in this particular post might not look like much at first glance. In fact they are quite extraordinary. Not the photos themselves, of course, but what is pictured in, and suggested by, them. 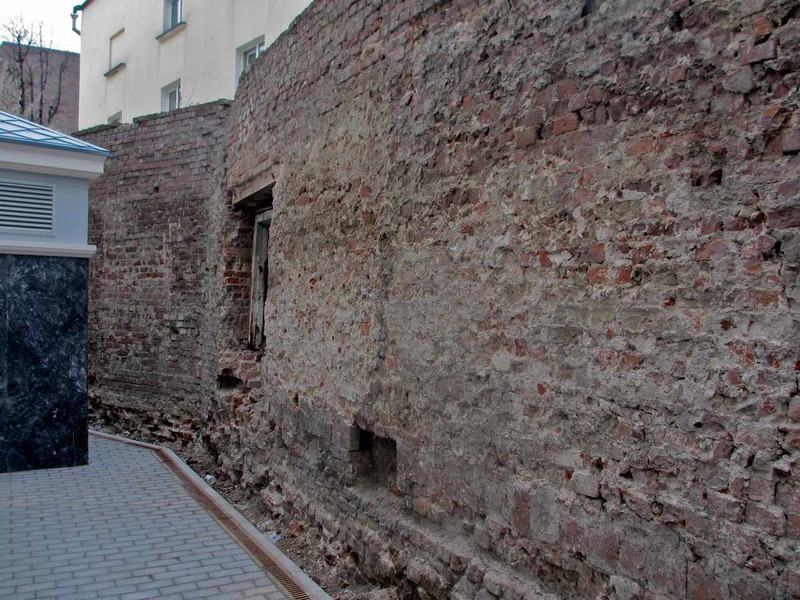 This is all that is left of a building in which the Moscow Art Theater actress Angelina Stepanova lived in the late 1920s and early 1930s – a single wall, stripped down to the bricks on one side, still painted yellow on the other. To be honest, I can’t be sure this wall was actually part of the structure where people lived. It might have been a garden wall of some sort. One detail in the two photos above makes me suspect it was part of the building proper – that window, which is still visible from the “inside” of the wall, and the traces you can still see on the “outside” of the wall where it was blocked up at some point. 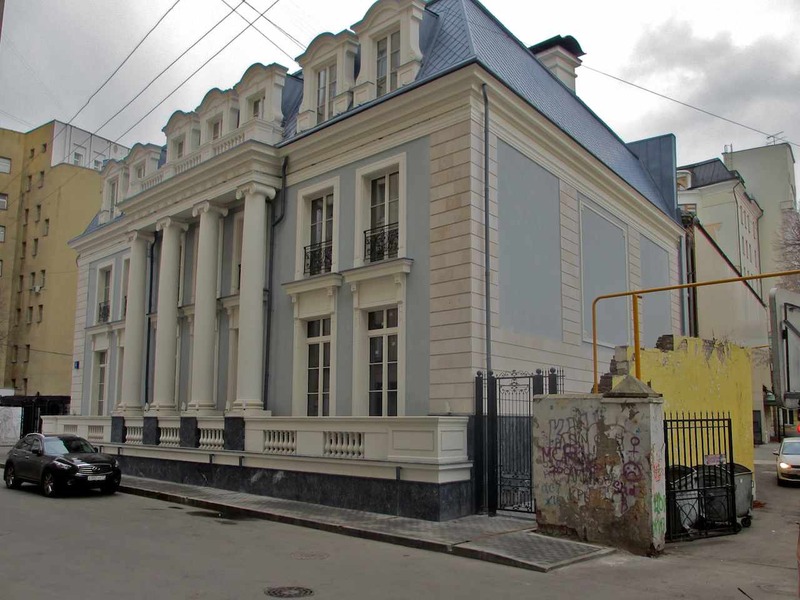 The address of 4 Krivoarbatsky Lane, which is where Stepanova lived, is now occupied, if you will, by a fancy new, faux old building. I’m sure the architect thinks it is beautiful and I suspect the people that paid the architect all that money to build it agree with him or her. I think it looks like a damn doll house. It sticks out like a sore thumb. It screams of arrogance. Faking the elements of old architecture, it screams, “I am new and I am hot!” I really took a disliking to it as I walked around it. It made me love the crumbly old wall all the more. 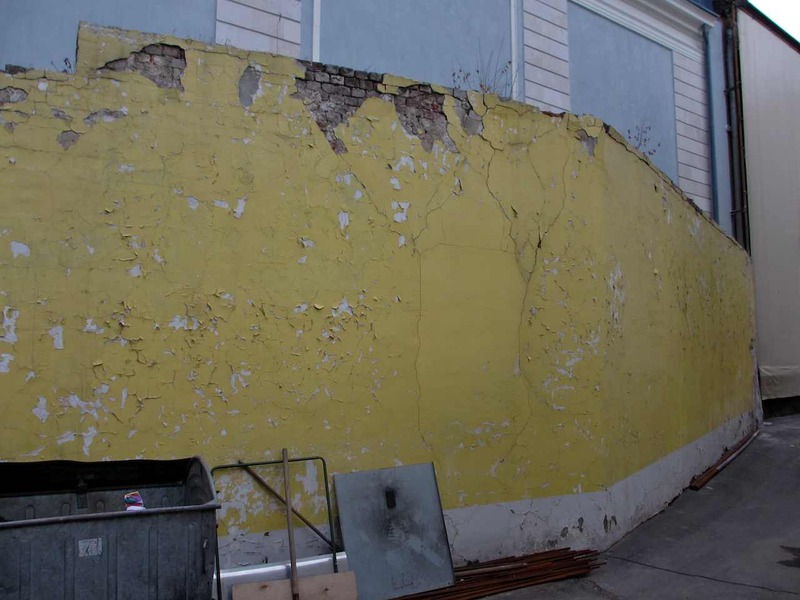 There is a sense of reality in that broken, abandoned wall that the new building will never have. 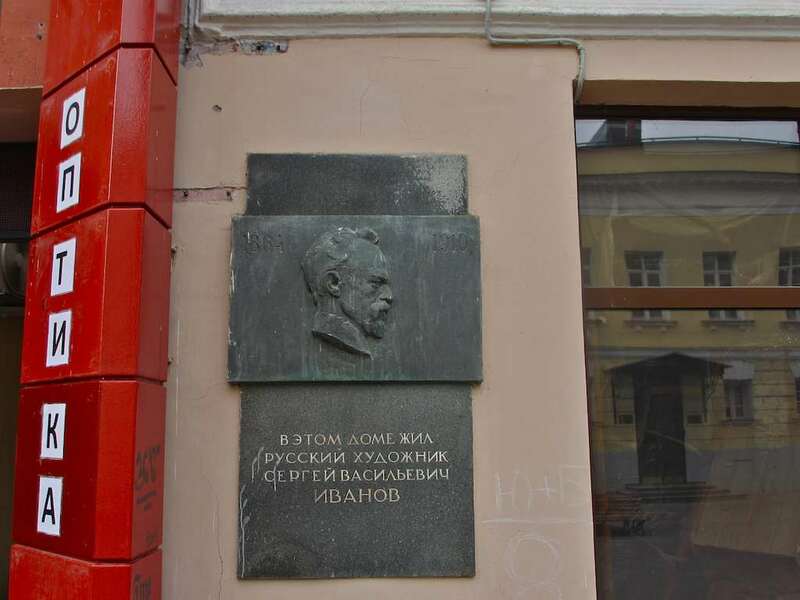 I should add that Stepanova lived with her husband, the Moscow Art Theater director, Nikolai Gorchakov at this address. They were married in 1924. Before long they would part. That happened in 1933. The reason for the rupture was that Stepanova began a serious affair with the playwright Nikolai Erdman. In her memoirs, edited and published together with her correspondence with Erdman, Stepanova wrote, “The feeling that arose in me for Erdman was so strong that it forced me to divorce my husband.” The two did, however, remain friends for the rest of their lives. Gorchakov worked on several of the Art Theater’s famous productions and he was the author of several books about the Art Theater that retain value even today. Stepanova’s story of returning home from the theater after performances is worth providing in some detail. 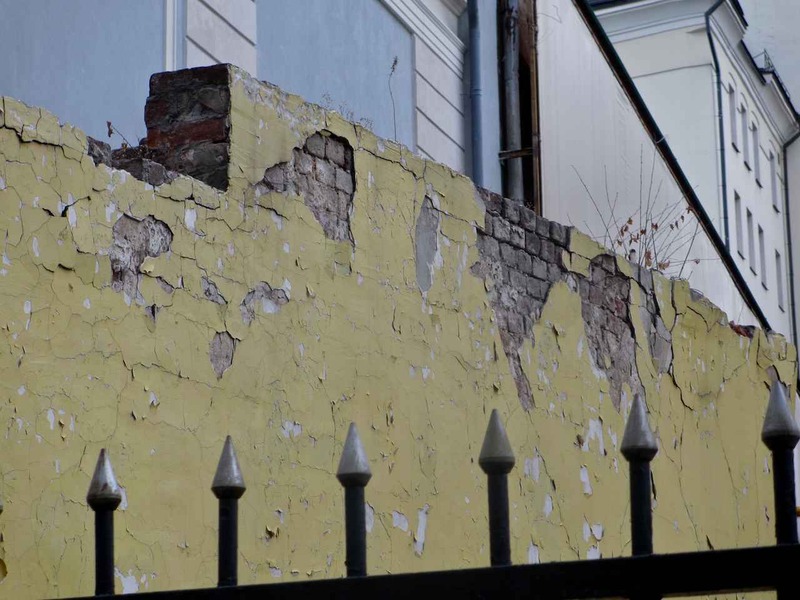 This wall here – now knocked down to a single story in height, still painted yellow on the north side from some time in the past, and scraped back to the original material on the other – is all that is left of the world Stepanova describes. 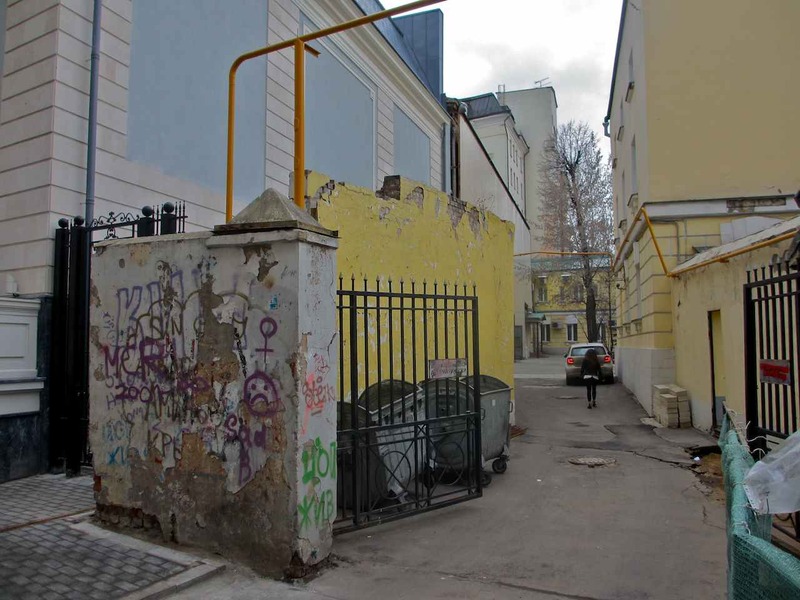 This wall was there to see Vasily Luzhsky drop Stepanova off after performances in his horse-drawn carriage. It witnessed Babel and Olesha and Meyerhold and Raikh coming to visit. It caught glimpses of Erdman when he began sneaking in and out. It was there to watch Stepanova’s marriage to Gorchakov fall apart. 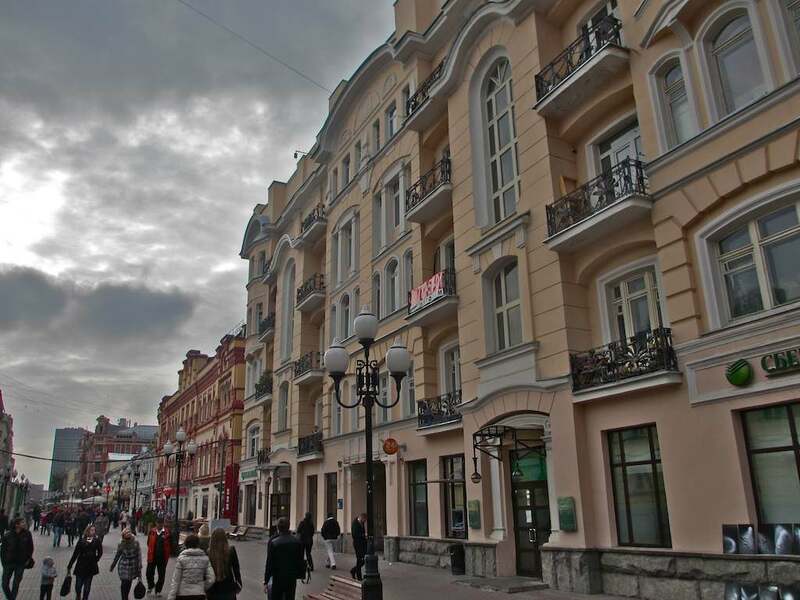 It was there in the early 1930s to see her move to another apartment on Ogaryov Street near Tverskaya Street – an address I have written about elsewhere in this blog. 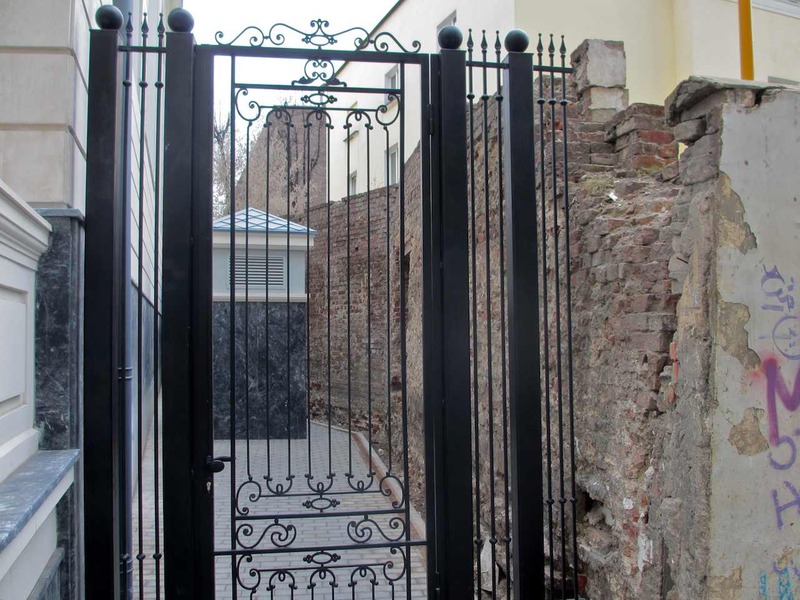 There is something incredibly moving about this – a fragment of lives lived and lost. Everyone mentioned in this story today – although it seems as though they are very much a part of our lives – is dead. Stepanova, who was born in 1905, died in 2000. Erdman died in 1970. 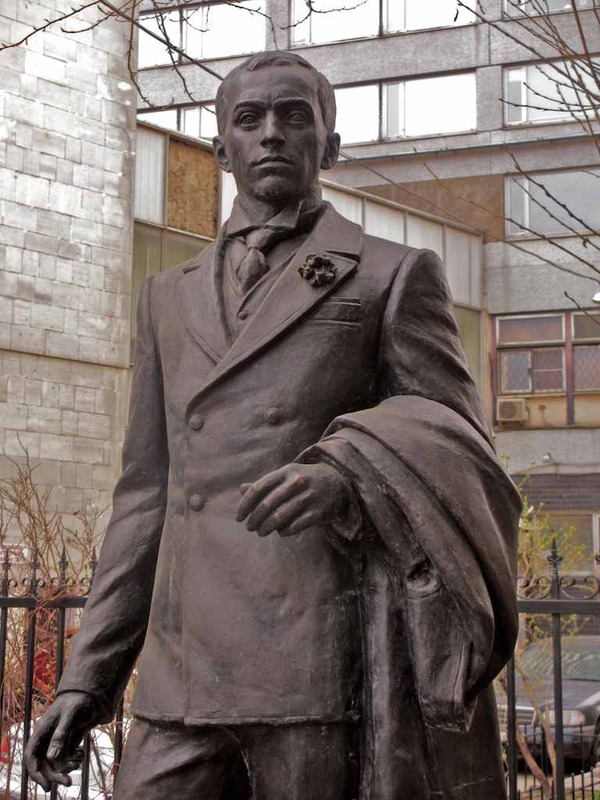 Gorchakov died in 1958. Vorontsova, whose real name was Nadezhda Alexandrovna Yashke) died in 1942. They’re all gone. Only this wall remains, threatened, but not yet conquered, by the big blue monster that now towers over it. Knowing how these things go, the wall probably will not last much longer. Take a look while you can. If you read this blog you have seen this building already. It came up awhile back when I wrote about the exquisite Soviet prose writer Yury Kazakov, who lived here. 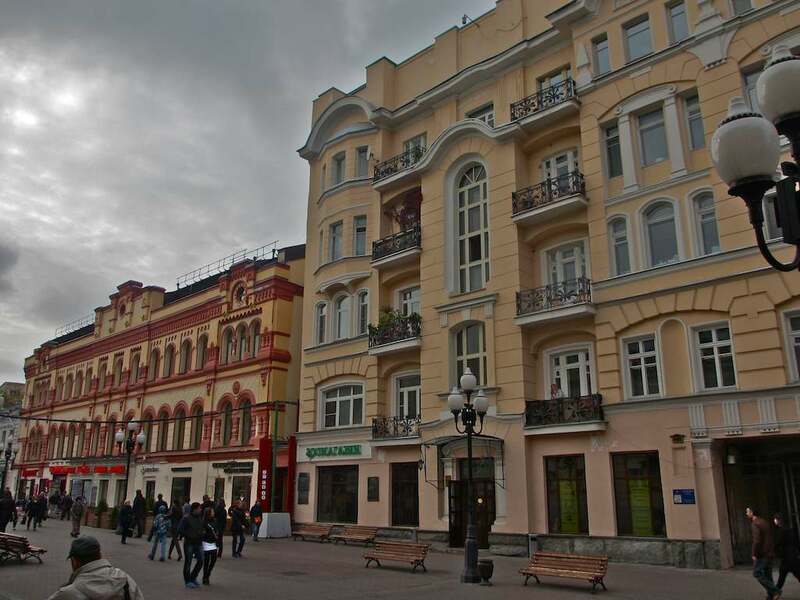 But this building at 30/3 Arbat was also home much earlier to the painter Sergei Vasilyevich Ivanov. I provide Ivanov’s patronymic because there are numerous artists named Ivanov and even two or three others with the first name of Sergei. We’re talking about the Sergei Ivanov who was born in 1864 and died in 1910. He was a member of the influential and ever-popular group of artists called the Peredvizhniki, or the Wanderers or Itinerants, along with Ilya Repin, Ivan Shishkin, Vasily Surikov, Arkhip Kuindzhi, Ivan Kramskoi, Valentin Serov, Isaak Levitan, Viktor Vasnetsov and other great landscape and narrative painters. 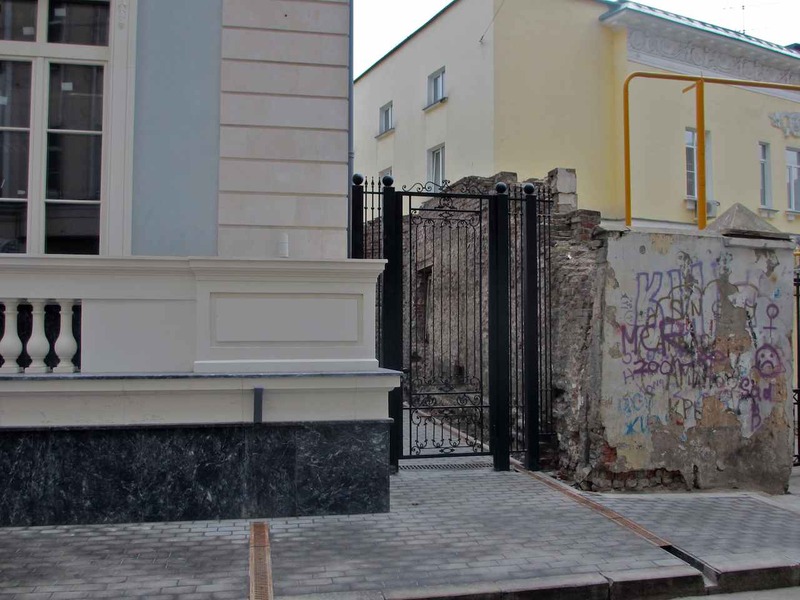 He was always something of an upstart politically and socially, and it’s perhaps not surprising that he ended up quitting the prestigious Academy of Arts in Petersburg before finishing his education because, in part, he didn’t like the way the place was run. Ivanov was one of the founders of the Union of Russian Artists. Different sources provide different titles for Ivanov’s first painting, but it’s clear he made an impact from the very beginning of his artistic career. One source, Russian painting, declares that Ivanov’s first canvas was “On the Road. The Death of a Migrant” (1889) and that it brought the artist immediate fame. Indeed it is a powerful piece showing a family in the middle of nowhere left destitute by the unexpected death of the head of the household. Russian Wikipedia goes back to 1883 and the painting “The Blind Ones” for the beginning. This is probably closer to the truth, referring to an early student work, while the reference to “On the Road” is probably to Ivanov’s first “professional” work. I’ll leave the bean-sorting to the experts and just point out this – both of these paintings are clearly intended to make moral and social statements. 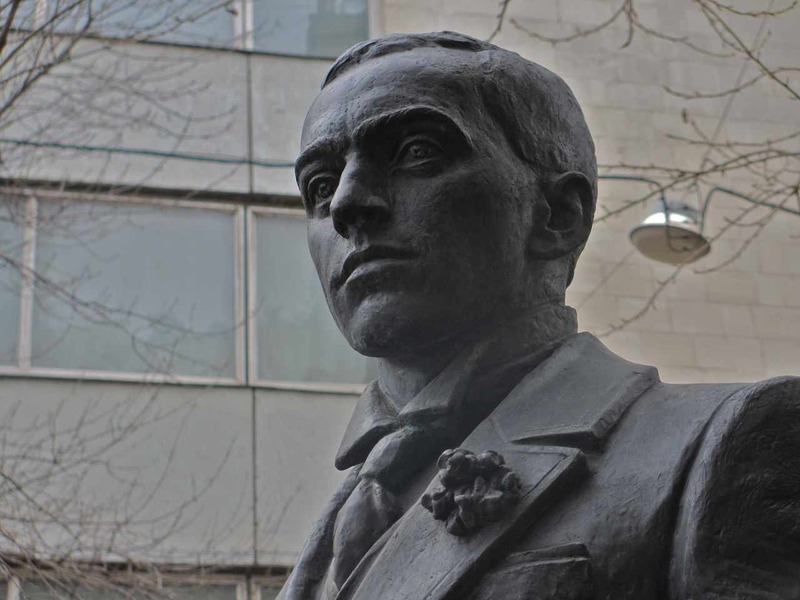 The shorthand here is that Ivanov was not one to turn a blind eye to injustice and the difficulties of the world in order to live out his life in art comfortably. Not surprisingly, I think, this remained a part of the artist’s personal makeup throughout his entire life. He was a witness to, and a participant in, a massacre of Moscow students by the police during the failed revolution of 1905. According to the Famous Russian Artists site, he attended to wounded students in the building of Moscow University. (See below for more on this.) This led to him painting one of his most famous late works, “The Execution,” a grimly laconic piece showing two bodies lying in the snow against an urban background. Ivanov never showed this painting to anyone during his lifetime and it was first publicly exhibited only in 1917. I mean nothing evil whatsoever in saying I fear Yury Kazakov (1927-1982) is on the verge of being forgotten. Maybe I’m actually saying something almost good. Maybe I’m saying that Kazakov, who was once one of the most respected Soviet writers (reviled, naturally, by “official critics”), and who remains a standard of excellence for those in the know today, is one of those inconstant beacons that remind us excellence is its own reward, everybody else be damned. Maybe I’m saying that Kazakov, in some odd way, grows in stature all the more as subsequent harried generations lose themselves in the vanity of their affairs. I was introduced to Kazakov’s work while studying Russian and Russian literature at the University of California at Irvine. He was presented to us with great trepidation, I would say, with great respect, with words of sincere admiration for a writer who based everything he did on quiet subtlety. I remember Bulat Okudzhava talking about him with great respect when he lectured at Irvine in the early 1980s. I also remember Vasily Aksyonov applying the same respect to his work when he conducted seminars I attended during my time at George Washington University a year or two later. Those opinions had a powerful effect on me and they have lasted. Even though I haven’t read a single thing of Kazakov’s since the early 1980s. And, indeed, I never hear anyone talk about him today. Let’s say I just move in the wrong circles. I’m in the wrong place at the wrong time. It’s certainly possible. Life is too big for any one of us to embrace fully. We do it badly, incompletely, lacking the proper understanding and perspective. What we’re left with is our own personal perspective, not unimportant by any means, but significantly flawed. This, perhaps, is why I always have such a warm feeling when I pass by building No. 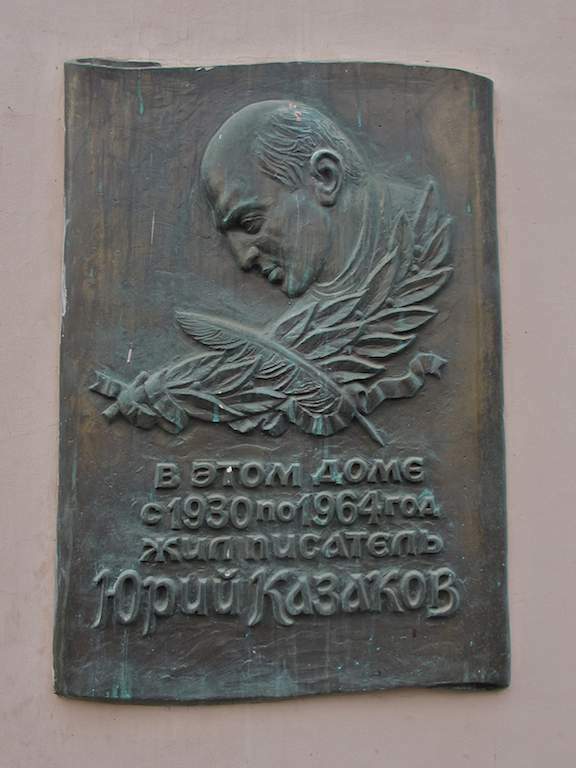 30 on the Arbat where a plaque was erected in Kazakov’s memory. The future writer moved into one of the communal apartments here with his mother when he was three years old, and he spent the next 34 years here. There’s a nice anonymous text called “The Hidden Light of the Word” in the internet that sheds light in snippets on Kazakov’s life here. It talks about the young boy going to music school holding his sheet music in a folder while standing outside the apartments of Svyatoslav Richter and Nina Dorliak, spellbound by the sounds of them playing the piano (Richter) or singing (Dorliak). 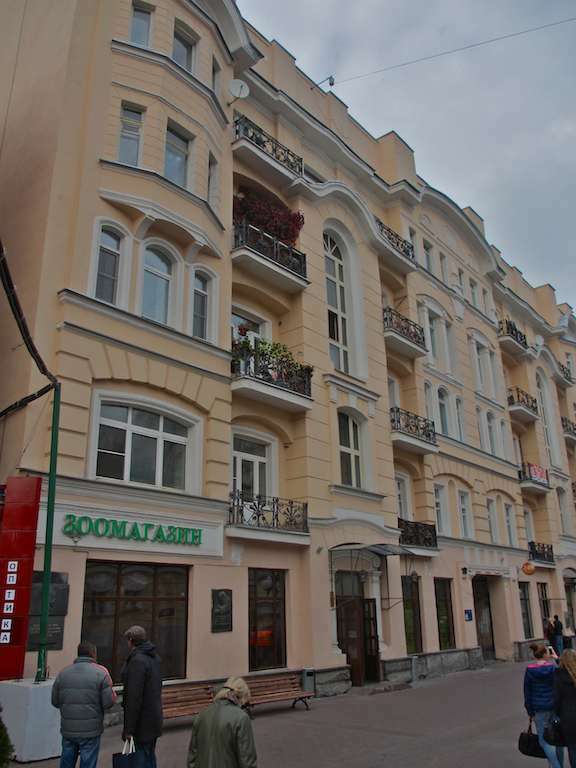 During WW2 a bomb fell on the roof of this building and, our anonymous author tells us, Kazakov was one of those who ran up to help put out the fire. He would have been 15ish. 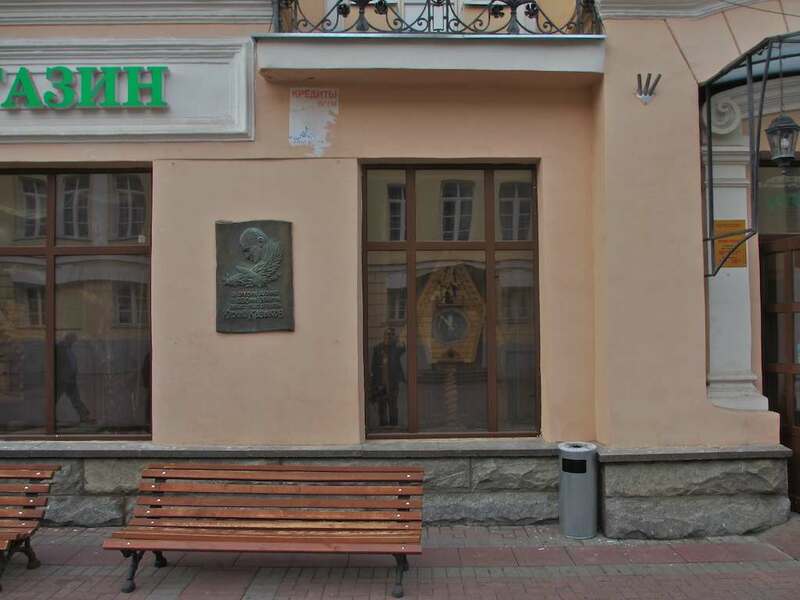 So it was while Kazakov lived in this building that his literary reputation was established. His first book was published in 1959 in Arkhangelsk. In April 1959 Kazakov, in a letter to a friend, quoted one of the phrases from the first review: “In our opinion the appearance of Yu. Kazakov’s book, which crudely distorts our reality and the image of our contemporaries, the builders of Communism, is a mistake of the Arkhangelsk publishers…” Jesus. It sounds like the crap hack critics are writing about Russian playwrights in 2014! In my ignorance, having read just a few of Kazakov’s stories (30 years ago!) 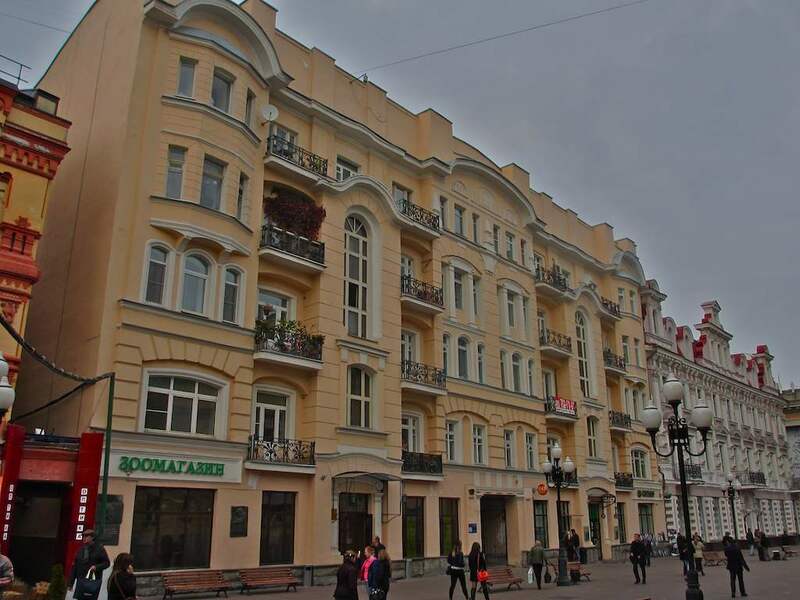 but remembering well a few well-chosen words of praise, every time I pass by this building on the Arbat I do it with an especial feeling of deference and appreciation.